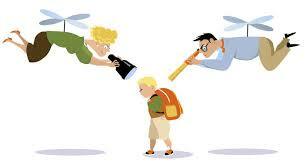 Helicopter-parenting: if you’re in the 35-55 age range, you may have observed this phenomenon in your peers. And maybe you’ve fallen prey to it yourself. It’s easy to do because you’ll do almost anything for your kids. Some call it helicopter-parenting. A recent NY Times article referred to it as “snowplow parenting”, describing parents who clear any obstacles or challenges on the road ahead for their children – and linking the extreme expression of the behavior to the recent college admissions scandal. Born in the mid-1960s, I understand how this mind-set and behaviors developed. We grew up with the threat of nuclear war; we began to parent in the shadow of school shootings and watching passenger planes used as weapons. We have plastics in our food, polluted air and a warming planet. We became professionals in a time when it was acceptable – expected even – that households would have two working parents. Maybe that meant more money to go around, but it also meant less time to raise our kids. We felt guilty about rationing our time with them, and we worked hard to protect them from danger and adversity, believing this is what good parents do to raise good children. And then you layer on top of this the common desire to give your kids a leg up with excellent education. We all want our kids to have lots of options, so in addition to helping them become great athletes, we’re convinced they need to master the cello, learn to speak Mandarin and become captain of the debate team so they can get into the college of their choice. We curate all aspects of our kids’ lives because we love them. We don’t want them to experience pain or sadness or the feeling that they don’t measure up in some way. The ironic result from this desire to protect our kids is that it prevents them from experiencing failure and learning how to pick themselves back up. And it’s not just failure that we’ve been protecting our kids from: it’s any discomfort at all. The less exposure they have for discomfort, the less tolerance they have for it. And when we try to protect ourselves and our family from vulnerability, we actually become more fragile and less resilient. This idea is illustrated in great detail in The Coddling of the American Mind: How Good Intentions and Bad Ideas are Setting Up a Generation for Failure, by Greg Lukianoff and Jonathan Haidt. The book highlights the unintended consequences of the culture of “safetyism” that Generation Y and Generation Z (or iGen) of emerging adults has been indoctrinated into by their well-intentioned parents. Instead of confident, happy, thoughtful children, the authors believe this approach protecting children from discomfort and risk has resulted in unprecedented levels of depression and intolerance and created a generation of young adults who are unprepared for adult life. These children are showing up at college untrained and ill-equipped for success. The President of American University explains her observations at length in a recent essay. Yet what we’ve created is a generation that is more stressed, depressed and emotionally ill-equipped to handle life. And we’ve done it out of love. This may be the parenting legacy we leave behind for our children. Snowplow parenting is a response in many ways to not just the environment we’ve raised our kids in, it’s also a response to the legacy of the parenting we received growing up. Like every generation of new parents, our parenting styles are informed by what worked and didn’t work during our own childhoods. We were raised by people who came of age in the 60s, in a country that was deeply divided by the war in Viet Nam and grappling with racial and gender inequality. There was optimism and confidence that came from watching astronauts walk on the moon while there was also fear of communism pushing democracy aside. This backdrop informed its own parenting legacy, complete with some positive aspects and some negative. Fast forward to today, and our desire to nurture our children has created its own consequences – with a mixed outcome. There is no doubt that each generation will form a new parenting legacy in response to the way they were raised. You can see it in both larger cultural expressions and in individual family expressions. Why is this important? When you acknowledge that relationships are our most cherished and valuable assets, you recognize the importance of your parenting legacy. Whether you are a snowplow parent, the parent of one, or an advisor to a generation of them, remember that we’re all just trying to do our best for our families. Some of the behaviors we thought were helpful are not. Condemning them isn’t helpful. Work to change them instead. Rather than clearing the road ahead, focus on providing the skills and support so the kids can drive the plow on their own road. It’s actually important – no essential – for kids to fail. They must fail and rebound to develop confidence in their ability to recover from loss, failure, embarrassment and mistakes. As parents, we need to back off and become more comfortable wiping the playground scrapes from their palms, letting them feel frustrated, sad and angry and sit with them as they dust themselves off and prepare to try again. This is easier said than done since we’ve convinced ourselves that the better we are at protecting our kids from pain, the more effective we are as parents. It’s work worth doing. And for those of you who work with the generation of helicopter / snowplow parents, remember that these parenting behaviors come from a place of deep love for our children. Your job is to help loosen their grip on the steering wheel of the big rig that been clearing the obstacles. Rather than judge them, look at how to support those parents and help them change the behavior that creates the negative consequences. We often focus on what we can measure, which means when we think about our legacy, we go straight to money. Don’t forget that nurturing relationships requires time and attention too. These intangibles are likely to be more valuable to our children than the financial assets we leave behind. Such a thoughtful post and beautifully written. Thanks, Peggy! I’m glad it resonates for you. Please feel free to share it with anyone you think will appreciate it.